*Database errors included data entry errors and misclassification of when INR was reported. ED—emergency department, INR—international normalized ratio. ↵* The differences between after-hours notification and notification during clinic hours are significant (P < .001). ↵† More than 1 strategy to alter care is possible, except both holding and reducing warfarin. 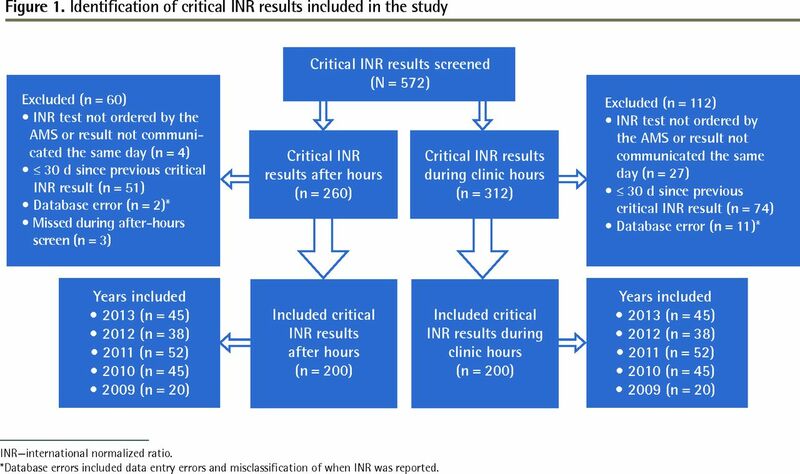 ↵‡ Includes 7 critical INR results without event-related outcomes for 30 d either owing to transfer of care to patients’ general practitioners or warfarin discontinuation. DVT—deep-vein thrombosis, GI—gastrointestinal, INR—international normalized ratio, LV—left ventricular, VTE—venous thromboembolism.